Posted by Kendra Bouda on March 19th, 2018 at 4:07pm . We are pleased to share Biotechnology Resources for the College Classroom, the first post in our new From the Archive blog series. Each From the Archive blog post will highlight a few selected resources from the ATE Central resource portal to further promote the work of the ATE community. This month, we’re highlighting the work of three ATE projects and centers that have created a wide variety of presentations, lessons, activities, course outlines, and more. These resources illustrate the breadth and depth of the biotechnology curriculum represented in the ATE Central resource portal and may be useful to STEM educators across bio and chemical technology sectors. Stored as Moodle backup files, these courses may be uploaded to a user’s own learning management system (LMS) or accessed online via the URLs provided. The content of each course, which has been made available to users under a Creative Commons Attribution 4.0 International License, may be shared or adapted to meet the user’s specific classroom needs. Explore these modules for teacher notes, rubrics, lessons, student activities and assignments, labs, quizzes, and other learning resources. In Biotechnology Module A, a course developed by Articulated Technological Education Pathways (ATEP), students are introduced to the fields of biotechnology and engineering. Students will also discover how science, technology, and engineering come together to help solve problems; explore different fields of biotechnology and its applications in everyday life; review basic biology and engineering principles; create an artificial source of insulin; work as a team to design, build, test, and evaluate a bioreactor; and use technology to solve problems. In Biotechnology Module B, students use tools and skills introduced in Module A. In this module, students will design a bioreactor for producing microbial proteins, describe the parameters that can be altered to affect microbial growth and product formation, and identify methods for detecting the presence of enzymes. 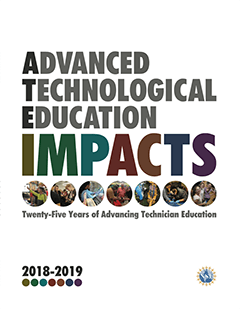 For more archived resources by Articulated Technological Education Pathways (ATEP), visit the ATE Central resource portal. Bio-Link offers a number of Course-in-a-Box resources intended for instructors to adapt and introduce into new courses. These collections of resources have been compiled and contributed by instructors of Bio-Link programs. Resources may include course descriptions, student outcomes, schedules, reading assignments, laboratory exercises, lecture materials, homework, classroom activities, exams, and videos. Check out these sample Courses-in-a-Box or click on the link below for even more options to explore. ATE community members who are interested in using a Course-in-a-Box may sign up for a free Bio-Link membership and gain access to additional instructor materials. For more archived “Courses-in-a-Box” offered by Bio-Link: Educating the BioTechnology Workforce, visit the ATE Central resource portal. The ATE Central resource portal houses an assortment of syllabi and other course outlines, which faculty members may find useful in designing or structuring their courses. Below are two examples from Increasing the Student Biotech Pipeline—a project focused on developing academic pathways and curricula in biotechnology leading to stackable certificates and an Associate of Science degree. These outlines may serve as examples for others looking to offer similar programs. In Biotechnology I, taught at Los Angeles Mission College, "students examine the fundamentals of cellular and molecular biology and are introduced to basic biotechnology laboratory skills, including documentation, safety, solution and buffer preparation, quality control and bioethics. Students develop proficiency in aseptic technique, spectrophotometry, microscopy, and centrifugation." In Biotechnology II, "students are introduced to modern molecular biology techniques, including nucleic acid isolation, recombinant DNA techniques, cell transformation, recombinant DNA analysis, nucleic acid hybridization, and DNA sequence analysis. Students explore the production and purification of proteins using biochemical techniques such as immunochemistry and chromatography." For more archived resources by Increasing the Student Biotech Pipeline, visit the ATE Central resource portal.